Refresh your knowledge of grammar terminology, syntax and parts of speech while learning how to teach grammar in an ESL classroom. 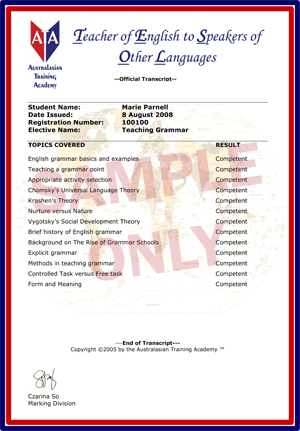 Teaching Grammar is a detailed course on everything a TESOL teacher needs to know in order to teach grammar effectively. Beginning with parts of speech, Teaching Grammar will provide not only an overview of grammar terminology but also self-assessment exercises to refresh your grammar knowledge. Delving into linguistics and grammar including structure, concepts and theory, TESOL teachers will develop a strong understanding of the role of grammar in language. A detailed course in English language and teaching grammar outlines the history and development including its origins. This course, though, is more than theory and language structure. Teaching Grammar is packed full of grammar games, exercises and activities for the ESL classroom, providing the TESOL teacher with everything needed to begin teaching in the grammar classroom. Q: I have not studied grammar for years, will I be able to teach grammar? A: Yes, this course will provide everything needed to refresh your grammar knowledge and teach grammar in the classroom. Q: Where can I find grammar games for the ESL classroom? A: Teaching Grammar is full of excellent resources and grammar game ideas.